Commercial buildings and office buildings are both common sites for spider, ant, cockroach, and rodent activity. Spiders are the most common invader and can leave unsightly webs in and around windows and office door frames. Our seasonal “Power Spray” application will eliminate spider activity from developing during the summer season. 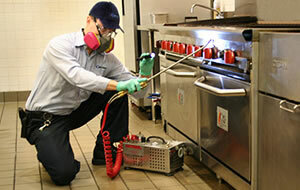 Matrix Pest Elimination can help with services that get rid of all types of pests quickly and effectively. We start by examining problem areas in your commercial building to determine exactly where pests live and breed. Then we apply only the safest formulas, using our own carefully developed methods, to rid your spaces of pests permanently. MATRIX PEST ELIMINATION offers monthly and quarterly services, specially tailored to ensure your employees and office tenants never experience unwanted visitors.